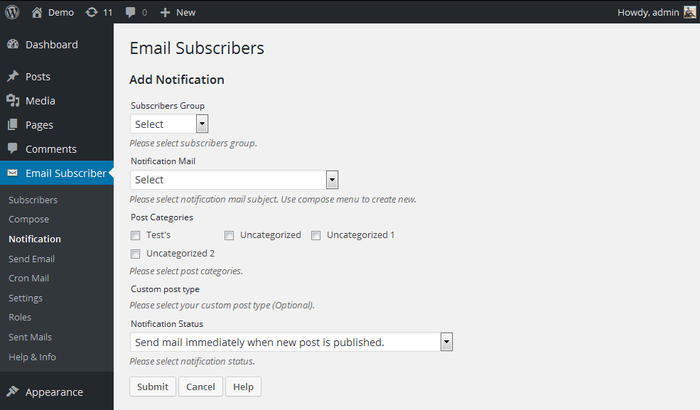 As mentioned, this plugin have option to send notification email to subscribers when new posts are published into your blog. In this page you have to configure the notification settings. When you activate the plugin, it will create default notification with existing categories. Whenever you create a new category in your bog, you need to add that category into notification setting, if you need to send email when posts published for that category. Also in this page you have option to select email template which you have created on compose mail page and option to select subscriber group. It means, whenever new posts are published to the selected category, selected email go to selected subscriber group.